Explore royal towns, tea plantations and sleepy coastal villages before reliving your adventures over a sumptuous feast. Our experience of crafting elegant dishes aboard make dining a highlight of your journey. 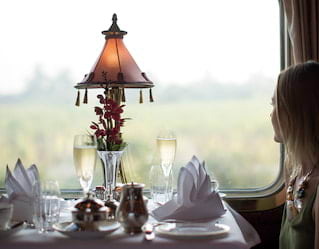 Unforgettable dishes, convivial company and spectacular views: discover what the Eastern & Oriental Express is all about. Our internationally renowned chefs create dishes to rival the world's best restaurants, from pan-fried scallops to Nyonya curry. Take a seat in the Restaurant Car for delicious lunches and dinners. An enticing continental breakfast is served in the comfort of your cabin daily. Journey from Bangkok to Singapore and anticipate sensational cuisine from Ian Kittichai. Thailand’s first international ‘celebrity chef’, Kittichai uses his Thai flair to turn local ingredients into spectacular breakfast, afternoon tea and dinner menus. Deepening the culinary discovery, you can accompany Chef Kittichai on a tour of the food market at Kanchanaburi. 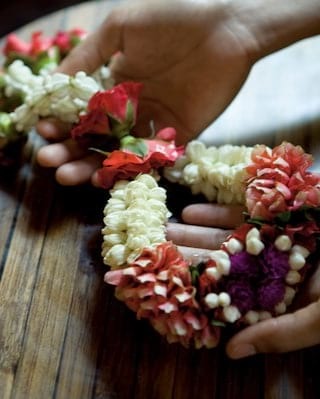 You’ll learn about the fragrant local produce and discuss tips and tricks for the kitchen. Join Chef Mangan as he explores Singapore’s exotic food market before boarding the train for a journey to Bangkok. Spend time with Mangan as you journey through Malaysia, past rural landscapes and ancient villages. Firmly established as a leading figure on the Australian and international food scenes, Luke Mangan has 19 restaurants to his name. Travel with us and take home a signed copy of his latest book; ‘Salt Grill: Fine Dining for the Whole Family’. Famed for her cutting-edge creations, Asia’s best pastry chef leads you on a thrilling culinary voyage from Bangkok to Singapore. Janice Wong boldly pushes the boundaries between sweet and savoury to create breakfast with a twist, irresistible afternoon tea and exquisite dinners. Under Janice’s guidance, you’ll uncover the secrets of her innovative style with a flavourful cooking atelier and a lesson in the delicious art of chocolate painting. Driven by a deep passion for Asian and French cuisine, Chef Didier Corlou’s culinary experiments are a sensation in gastronomic alchemy. Didier is famed for his exceptional creations, the finest of which will be served on board the Eastern & Oriental Express. Step aboard in Singapore and sample Chef Didier’s signature culinary combinations as you venture through Malaysia and Thailand. You’ll also enjoy a fascinating flavour atelier led by this sultan of spice. Our signature cocktails were inspired by the lush jungle and intriguing cities we pass by. Toast the evening with a punchy, distinctive Hills of Perlis or close the day with a sweet, warm Royal Nightcap. Our signature drinks blend vintage glamour with modern mixology to create a drinking experience that is truly unique. Champagne starts this four-course feast with a sparkle. Traditional favourites, locally-inspired options, seasonal fruits and more are offered on the second morning of every Classic Journey. Available for up to 10 guests for US$98 per person, this may be reserved at the time of booking. 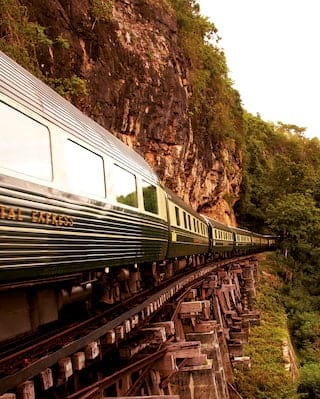 Luxury train tours on the Eastern & Oriental Express are a magical way to celebrate. Available for 80 guests or more, a luxury train charter will make a lasting impression.